"If you're not going to take care of them, don't have dogs." Hemet resident Trudy Muro said. The puppies, about three months old and apparently in good health, will be available for adoption. Tony Shin reports for the NBC4 News at 5, Wednesday, Feb. 27, 2019. 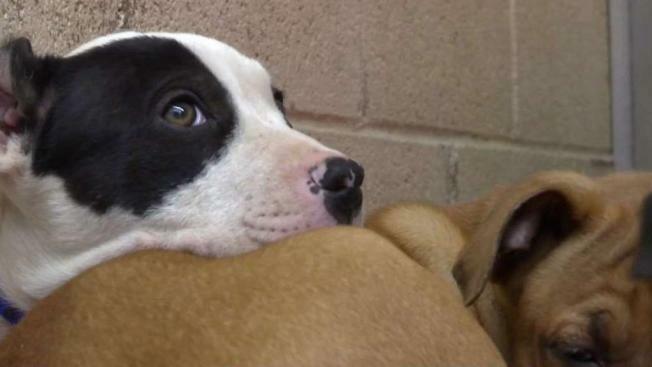 A garbage can full of puppies was dumped like trash outside a Southern California animal shelter Wednesday, and now animal control officers are trying to find the person who did it. Unfortunately the Ramona Humane Society in Riverside doesn't have surveillance cameras. Animal services manager Julio Delacruz says he found the bucket full of the eight lab-mix puppies, estimated to be around three months old, before a green truck sped off. "It was shock knowing that eight puppies were just left in this large tub outside out the lobby in broad daylight," he said. He also said people often drop off stray or unwanted animals at the humane society, but they usually stick around and give as much information as they can to the workers about the health of the animals. "If we can talk to the owners, we can at least gather much treatment they received, what vaccines, because that helps us better equip them when they come into a shelter," he said. The puppies will have to be vaccinated, even though they may have already been vaccinated before. But workers say there's a good chance the puppies will find a good home. People have already started calling them. After hearing about the abandoned puppies, a woman and her son decided to adopt one of the black and white ones and name him Oreo. They just happened to be at the shelter Wednesday, ready to adopt. "I'm pretty happy," Chris Loya, the adopter, said. The puppies will be officially up for adoption to the rest of the public Sunday. The previous owner, if caught, could face a misdemeanor citation and a hefty fine. "When shelters charge intake fees, it's the animals who end up paying the price. This shelter charges a minimum of $80 to take in an animal, so this litter of puppies could have cost those who abandoned the dogs $640, which is a huge deterrent to doing the right thing. This is exactly why PETA supports spay/neuter mandates and urges shelters to accept all animals in need without waiting lists or surrender fees, which can prompt desperate people to turn animals loose to fend for themselves, relegate them to a backyard, or even drown or kill them in other horrible ways." NBC4 had not yet verified the intake costs with the shelter.